Recruitment advertising generates good level of response for roles with civil engineering consultancy. 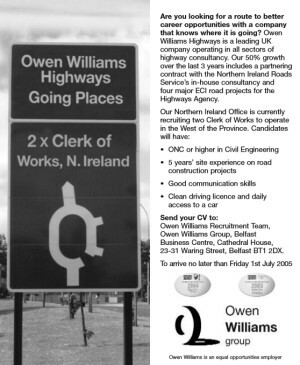 Owen Williams was a respected civil engineering consultancy with a long heritage and enviable track record in host of areas including roads, railways and bridges. This dynamic business was regularly on the look-out for talented recruits to support delivery of its prestigious, high-value contracts. Metropolis 2 was instructed by the civil engineering giant to develop a number of recruitment advertising concepts which would be submitted to the in-house marketing team for consideration. Metropolis 2 came up with concepts for each sector and the internal marketing personnel specified the concept that visually highlighted the sector in which successful candidates would work. Owen Williams approved this approach and it was developed for each sector. The “Highways” campaign was based upon that most recognisable element of road networks, the roundabout sign. The size and scale of the sign and number of notional exits were determined by the number of roles within the civil engineer. Space for the advertising was booked in a number of publications, ranging from local and national daily and weekly press to trade/professional media. The adverts were also posted in an online format within the relevant portal of the civil engineer’s own 450 page website that Metropolis 2 had helped to develop. Responses to the adverts were initially filtered via an external recruitment consultancy appointed by Owen Williams and then the short-list was considered by the in-house personnel department. 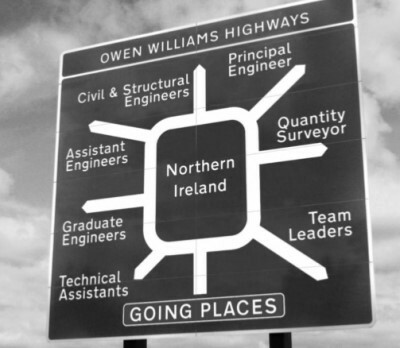 The “Highways’ Roundabout” campaign, in common with the other concepts, achieved good levels of response with feedback being that the visuals really stood out within the media, attracting the attention of high calibre, relevant candidates and drawing them in, inspiring them to apply for the positions.